Runcam is dropping yet another new HD camera to the FPV market – The Runcam 5! Thanks to Runcam for sending me a prototype unit so I can check out some of the features. GoPro is no longer making the Session 5, we are all wondering which HD action camera is going to take over the FPV market. The new Hero 7 Black looks sweet especially with the new Hypersmooth feature, but it’s so damn expensive and fragile to crash. For under $100, the Runcam 5 is the same size as the Session 5, and it’s capable of recording 4K 30FPS and 2.7K 50FPS. Maybe it’s the answer? Note: The unit I have is a prototype, there might be changes to the specs and features in final production. 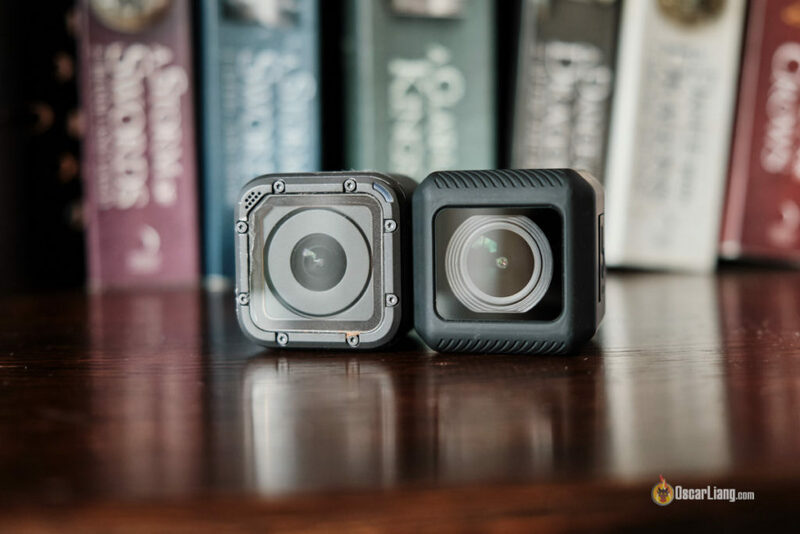 Runcam plans to release it around end of April. I will update the links to product pages once available. They did release the Runcam 4 earlier this year, and I did a review on it. But they decided to use it for the airsoft market, and not to push it to the FPV market. That’s probably why you haven’t heard much about it. Anyway I do think it makes a pretty good choice for airplanes and wings due to the aerodynamic shape. Note that the Runcam 5 does not support WiFi, and the battery is not removable. It’s great to learn that the Runcam 5 is the exact same size as the Session 5, which means all the 3D printed TPU mounts created for the Session will work on the Runcam 5 too. Same size as the Session 5, and it has built-in tempered glass for protection. There is a micro USB port on the side for charging and connecting to a computer. As you can tell, it’s not a waterproof design. Similar to the Runcam 3S, you can use the Runcam 5 as the FPV camera. The video out signal comes out of the Micro USB port. You can also power it through the Micro USB port so you don’t have to worry about running out of battery. It takes 5V to 15V. On the other side is the SD card slot which is protected by a sliding door. Although it’s claimed to support up to 128GB SD cards, I was having trouble getting my SanDisk Extreme Pro 64GB to work. I formatted the card inside the camera but it didn’t want to record. I swapped it out with a Samsung Evo 32GB which seems to work fine. To learn what SD card you need, see my tutorial. There is a tiny hidden button above the SD card slot, for formatting SD cards, as well as camera hard reset. It only has one push button on the top, and a color LED right next to it. Although Superview didn’t make it into the list of specs (well they can’t really, because GoPro owns the patent), but I believe the equivalent effect is totally achievable now thanks to the newly added 1440p 4:3 resolution. That’s one reason why I think the Runcam 5 is going to do well! I will do a tutorial on how to create Superview on the Runcam 5 in the near future. Since there is no screen in the Runcam 5, and they have removed the WiFi module due to space limitation, the only way you can change camera settings is through a text file on the SD card. By plugging in the USB cable, you can access the SD card in the camera. The settings are stored in a file called “CameraConfig.ini”. And you can open the file in a text editor. It should feel familiar to most people as it’s a bit like playing with CLI in Betaflight. 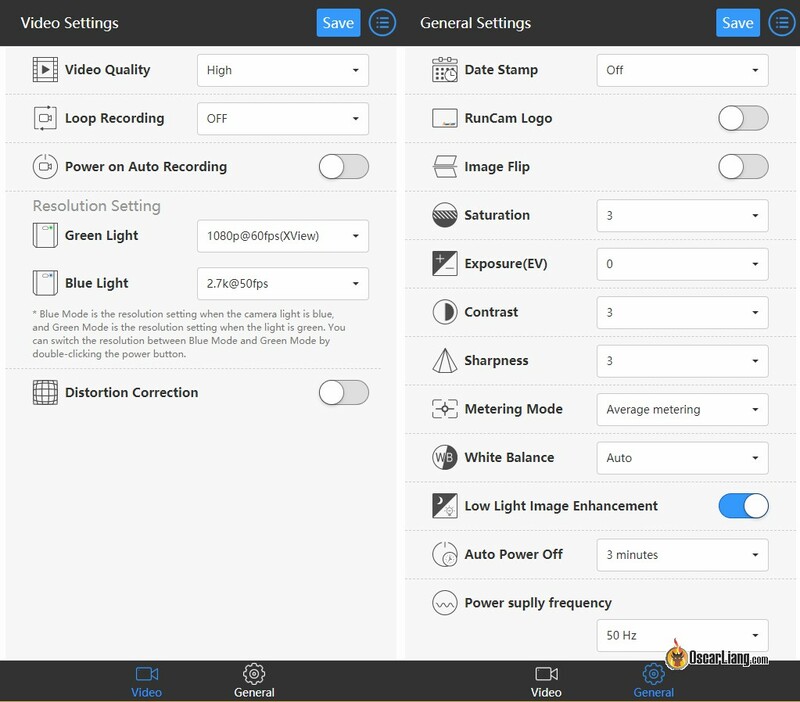 However this is quite counter intuitive, so Runcam made a web page where you can change the settings on a graphic interface. You can then download the file to replace the one on the SD card. It’s not the end of the world as we don’t change camera settings that often. But still, I do find it inconvenient as you can only do it when you have access to a computer. The good news is, Runcam is working on a new exciting method for changing settings, which won’t require a computer. I am not allowed to say much right now, but I will keep you all updated. I’ve done some initial testing, all I can say is the image quality is awesome 😀 I am helping Runcam to tweak a few things so it’s pointless to show you right now. It’s going to be different in the final production. Once they are happy with the result, I will do some side by side testing with the GoPro Session 5, stay tuned!